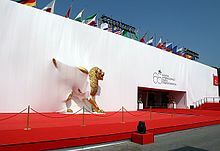 The Venice International Film Festival is part of the Venice Biennale. The famous Golden Lion is awarded to the best film screening at the competition. Biennale (pronounced [bi.enˈnaːle]), Italian for "biennial" or "every other year", is any event that happens every two years. It is most commonly used within the art world to describe large-scale international contemporary art exhibitions. As such the term was popularised by Venice Biennale, which was first held in 1895. The phrase has since been used for other artistic events, such as the "Biennale de Paris", "Kochi-Muziris Biennale", or even as a portmanteau as with Berlinale (for the Berlin International Film Festival) and Viennale (for Vienna's international film festival). "Biennale" is therefore used as a general term for other recurrent international events (such as triennials, Documenta, Skulptur Projekte Münster). According to author Federica Martini, what is at stake in contemporary biennales is the diplomatic/international relations potential as well as urban regeneration plans. Besides being mainly focused on the present (the “here and now” where the cultural event takes place and their effect of "spectacularisation of the everyday"), because of their site-specificity cultural events may refer back to,[who?] produce or frame the history of the site and communities' collective memory. 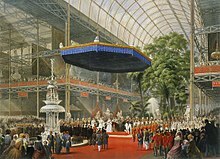 The Great Exhibition in The Crystal Palace in Hyde Park, London, in 1851, the first attempt to condense the representation of the world within a unitary exhibition space. A strong and influent symbol of biennales and of large-scale international exhibitions in general is the Crystal Palace, the gigantic and futuristic London architecture that hosted the Great Exhibition in 1851. According to philosopher Peter Sloterdijk,[page needed] the Crystal Palace is the first attempt to condense the representation of the world in a unitary exhibition space, where the main exhibit is society itself in an a-historical, spectacular condition. The Crystal Palace main motives were the affirmation of British economic and national leadership and the creation of moments of spectacle. In this respect, 19th century World fairs provided a visual crystallization of colonial culture and were, at the same time, forerunners of contemporary theme parks. The structure of the Venice Biennale in 2005 with an international exhibition and the national pavilions. The Venice Biennale, a periodical large-scale cultural event founded in 1895, served as an archetype of the biennales. Meant to become a World Fair focused on contemporary art, the Venice Biennale used as a pretext the wedding anniversary of the Italian king and followed up to several national exhibitions organised after Italy unification in 1861. The Biennale immediately put forth issues of city marketing, cultural tourism and urban regeneration, as it was meant to reposition Venice on the international cultural map after the crisis due to the end of the Grand Tour model and the weakening of the Venetian school of painting. Furthermore, the Gardens where the Biennale takes place were an abandoned city area that needed to be re-functionalised. In cultural terms, the Biennale was meant to provide on a biennial basis a platform for discussing contemporary art practices that were not represented in fine arts museums at the time. The early Biennale model already included some key points that are still constitutive of large-scale international art exhibitions today: a mix of city marketing, internationalism, gentrification issues and destination culture, and the spectacular, large scale of the event. The situation of biennials has changed in the contemporary context: while at its origin in 1895 Venice was a unique cultural event, but since the 1990s hundreds of biennials have been organized across the globe. Given the ephemeral and irregular nature of some biennials, there is little consensus on the exact number of biennials in existence at any given time. Furthermore, while Venice was a unique agent in the presentation of contemporary art, since the 1960s several museums devoted to contemporary art are exhibiting the contemporary scene on a regular basis. Another point of difference concerns 19th century internationalism in the arts, that was brought into question by post-colonial debates and criticism of the contemporary art “ethnic marketing”, and also challenged the Venetian and World Fair’s national representation system. As a consequence of this, Eurocentric tendency to implode the whole word in an exhibition space, which characterises both the Crystal Palace and the Venice Biennale, is affected by the expansion of the artistic geographical map to scenes traditionally considered as marginal. The birth of the Havana Biennial in 1984 is widely considered an important counterpoint to the Venetian model for its prioritization of artists working in the Global South and curatorial rejection of the national pavilion model. BiennaleOnline Online biennial exhibition of contemporary art from the most promising emerging artists. Taiwan Film Biennale, in Hammer Museum, Los Angeles, U.S.A. Web Biennial, produced with teams from Athens, Berlin and Istanbul. ^ Vittoria Martini e Federica Martini, Just another exhibition. Histories and politics of biennials, Postmedia Books, 2011 ISBN 8874900600, ISBN 978-8874900602. ^ Im Weltinnenraum des Kapitals, 2005. ^ "Scape Public Art". Retrieved July 7, 2016. Jones, Caroline (2006-03-29). "Biennial Culture". Institute national d’histoire de l’art, Paris. Federica Martini, Cultural event in Mobile A2K Methodology guide, 2002. Manifesta Journal No 2 Winter 2003/ Spring 2004 - Biennials. Artimo Foundation. 1 June 2003. ISBN 907538095X, ISBN 9789075380958. Vanderlinden, Barbara (2 June 2006). Elena Filipovic (ed.). The Manifesta Decade: Debates on Contemporary Art Exhibitions and Biennials in Post-Wall Europe (illustrated ed.). The MIT Press. ISBN 0262220768. "Global Exhibitions: Contemporary Art and the African Diaspora". Liverpool. 2010-02-19. Byrne, John (2005). "Contemporary Art and Globalisation: Biennials and the Emergence of the De-Centred Artist". Cambridge: University of Cambridge. This page was last edited on 8 March 2019, at 00:27 (UTC).